Knitted material. Picks up 90% of all dust deposits. Positively charged to pick up dust. These unique cloths are available in knitted styles. The knitted style works best on porous surfaces such as wood or textured tile for a deeper, more thorough cleaning. The Microscrub cloths are scientifically proven to pick up more then 90% of all dust deposits on highly contaminated surfaced. The cloths are always positively charged to pick up dust and require less chemical than conventional cleaning products. 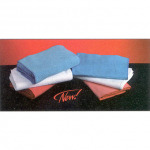 They are manufactured from split polyester, polyamide microfiber and can be machine washed hundreds of times for re-use. 13-3/4×11-1/2, 10/pkg.